Retirement is a large accomplishment. Your friend or loved one is celebrating their successful career and choosing to leave it behind for a more relaxing, carefree life. Our personalized bracelet would be a great gift to give someone to celebrate this wonderful new chapter in their lives. This retirement bracelet is fashioned of glass pearls, with brass end spacers and Tibetan Style toggle clasps. Glass Pearl Beads measure approx. 8mm wide by 8.16mm long. 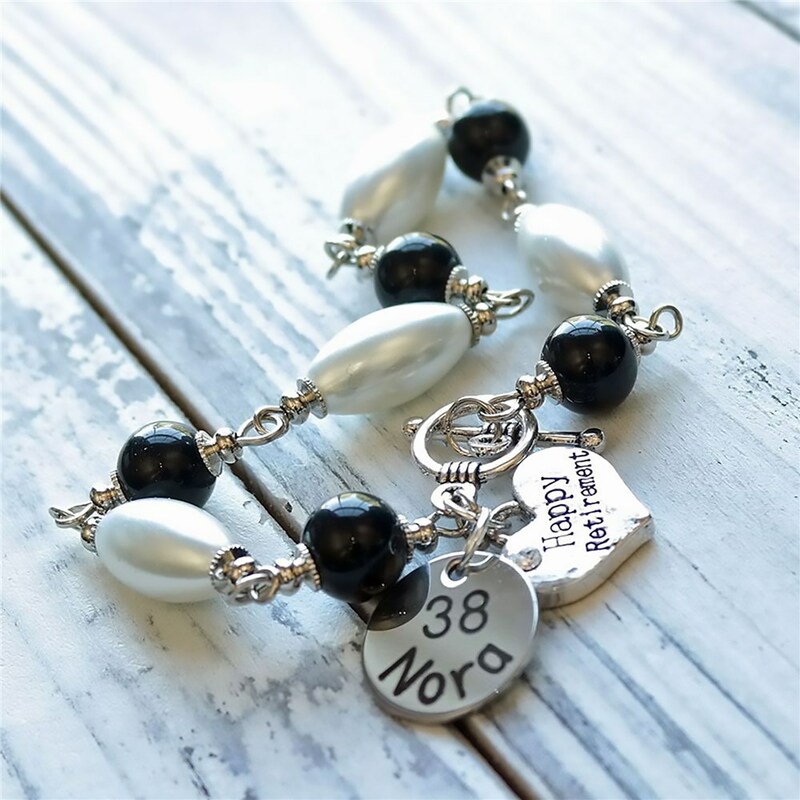 It includes a zinc alloy happy retirement charm with a crystal and a silver-plated charm that may be hand stamped with any name hand stamped around the edge and number of years in the center or you may wish to only include the years. Free personalization is included. Additional Details Giving a personalized gift to your friend or loved one who is retiring would be a sweet and appreciated gesture. As they start to live a life of rest and relaxation, you can give them this bracelet to celebrate all of their accomplishments. Our Engraved Beaded Silver Jewelry Box would be a great place for them to store their new accessory.